An organisational culture that is intolerant of fraud, bribery and corruption is one which recognises relevant risks and engages with staff to build their confidence to report concerns that they have. In order to embed such a culture within your organisation, we ensure that your staff have access to relevant information which is appropriate to their roles. Effective training develops staff awareness of key issues so that staff members understand and accept their own responsibilities to ensure working practices support the organisation’s drive to reduce fraud risk. 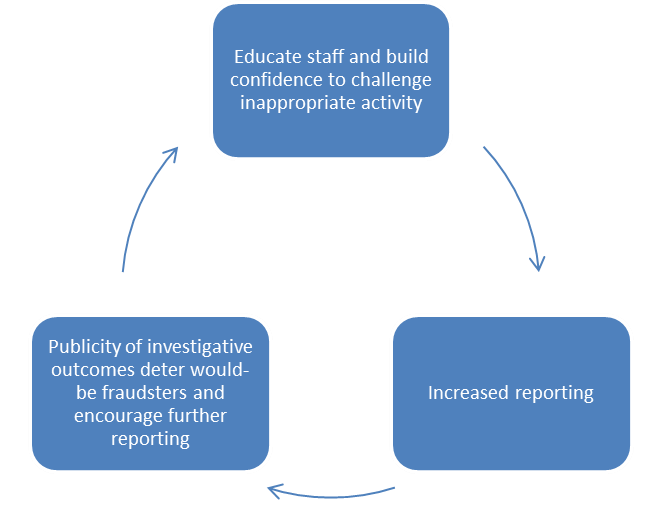 Providing staff and other key stakeholders with the knowledge to recognise and report poor practice and inappropriate behaviour allows the findings of subsequent investigations to feed back into publicity and training, further encouraging reporting and deterring would-be fraudsters. Testing of staff knowledge so that training can be calibrated to ensure the desired outcomes are achieved.